When my friend Elsa suggested we met at Princi last night, I thought that was a great idea. I was introduced to this London branch of a Milanese institution by my friend Lucia last year (click here) and I’ve been there a couple of times with her, eating in the self-service area and having just a drink and snack early evening. I suggested to Elsa it would be good to sit in the pizzeria section where there are proper tables rather than benches and waiters who will bring you food instead of queuing at the self-service bar. Artisan baker Rocco Princi’s smart chain of cafes selling home-baked breads, cakes and pizza capture some of the ‘spirito di Milano‘ – as they say on their website. This is informal eating that comes wrapped up in that inimitable Italian style where huge tiles of sleek polished sandstone stretch before you; glorious arrays of food lie on black marble – heavenly cakes, focaccia bursting with creamy buffalo mozzarella and thick slices of ripe tomatoes, hot trays of melanzane parmigiana. Everything looks beautiful. And so far, for me, everything had always tasted beautiful too; the pizze al taglio I had the first time; the gorgeous cannoli Lucia insisted I try and bought for me the second time. Their pizza was bound to be good too, wasn’t it? I arrived first, walking though the entrance, escaping the rain outside just as a text came through from Elsa saying she was nearly there. The woman at the door gave me a smiley welcome but wouldn’t give me a table until ‘my friend’ had actually arrived; why didn’t I go to the bar and have a drink. I didn’t want a drink I said; I wanted wine with the meal but didn’t want an aperitivo. The bar area at the back was crowded and no place to just stand and wait for someone to arrive. When you enter Princi the bar and self-service area are ahead and to the right; the pizzeria to the left. I ended up having to stand in a busy entrance until Elsa arrived about 5 minutes later. I have to say I felt a little annoyed; I can see they don’t want people sitting at the table for a long time while waiting for friends when they could be cooking someone else’s pizza, but frankly, I just wanted to be shown to a table and be able to sit down. 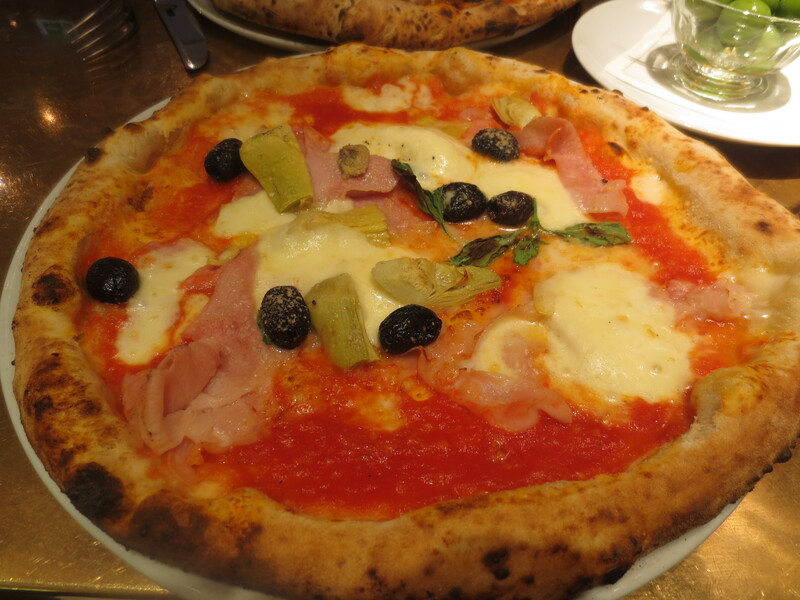 We chose our pizzas: a tuna one for Elsa and a capriciossa for me – with ham, olives and artichokes. We also ordered a mixed salad to share (there wasn’t a ‘green’ option) and two glasses of wine, asking for a bowl of olives to come with our drinks to eat while we waited for the pizzas. Service was slow and chaotic; the only speedy thing being the time it took them to cook the pizzas and serve them for they came almost instantly. In fact, everything came at once – no wine and olives to enjoy first while our pizzas were cooked. The bardolino wine by the glass was good though and so were the olives – those rather bright green ones from Sicily that I don’t usually like (they have a strong and sometimes unpleasant flavour) but these were good and we just ate them alongside our pizzas. Ah … the pizza! Le pizze. They did look good – a good topping, nicely charred dough at the edge, but what a disappointment they were. The dough was horribly chewy. I say ‘horribly’ with thought: it’s a big word to describe food. But really, it was so doughy and chewy it was unpleasant. My guess is they raise the dough too quickly in a too-warm environment and it doesn’t have time to create air pockets which will make the pizza light – and not doughy! The overall taste was OK but for this pizza lover, this really wasn’t the real Italian experience. 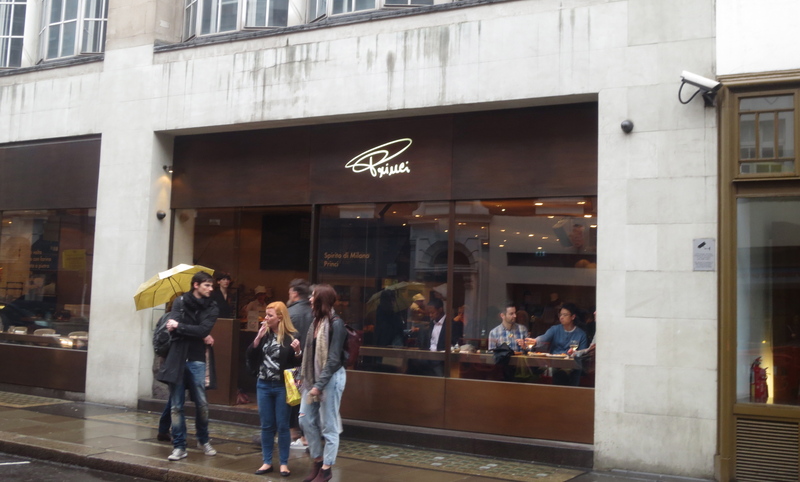 I’d travelled all the way to Soho on a wet Friday evening for a disappointing pizza (Elsa used the ‘disappointing’ word too) when I could have walked 10 minutes down the road from my house for one of the best pizzas in London at Ruben’s Refettorio. Well, I’d actually travelled all the way to Soho to meet Elsa who lives in north London and that was ‘the thing’, but it was a shame after my previous Princi experiences. It was only as we finished our pizzas that Elsa reminded me we’d ordered salad. We attracted a waiter’s attention. They seemed confused: did we want a salad? Yes, we’d ordered one and would still like it. It came fairly quickly but was definitely ‘green’ and not ‘mixed’. 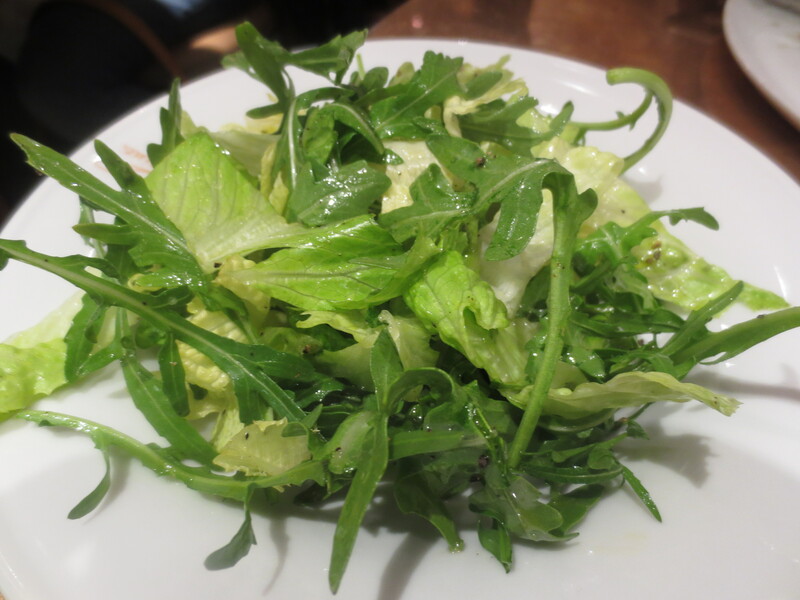 The only ‘mixed’ about it was about three different forms of greenery but not an inspiring mix and over salted. We ordered an extra glass of wine to share at this point. Neither of us wanted a whole extra glass but thought we’d share one. This confused them as they tried to take away our empty glasses, insisting they’d bring clean. Then they brought two more glasses of wine so we had to send one back and wait for them to bring another empty glass. There was a frequent sense of not being understood. I guess since Elsa is Italian and my clumsy Italian can at least order a meal, we could have spoken Italian (assuming the waiting staff were Italian) but we shouldn’t have to. We were in central London not actually in Milan. Well, we might have given up at that point but we were happy talking and my past experiences of Princi’s cakes had certainly been good. 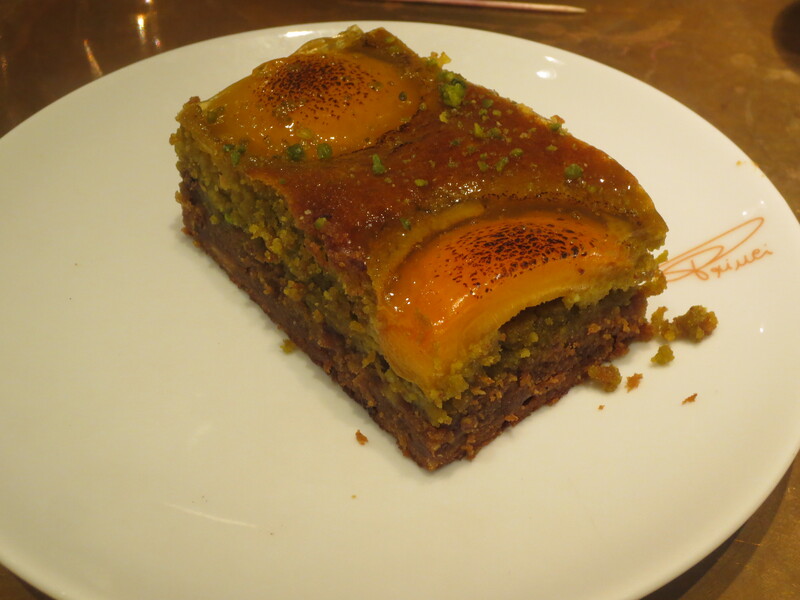 I’d looked at them while waiting for Elsa when I arrived and had spotted a pistachio and peach cake that looked pretty wonderful, so I ordered that. Suddenly things changed round: the cake was truly gorgeous; this was the Princi I’d experienced before. I’d also ordered an espresso, asking that it come after the cake. The ‘after’ was a few seconds; I’d barely started the cake. This was another slight annoyance. Well, as you can see, Princi turned into a disappointing experience which was a shame as I’d arrived expecting a good meal and had been happy to be going back. I do still like the place: I like its smart elegance, I like the buzzy atmosphere; I simply love their cakes. I’m sure I’ll go again; I’ll happily go again – but only as I have before: to eat in the self-service part for a snack – or it would be a great place for lunch. I love your reviews because they are always honest. I agree, the pistachio and peach cake looks scrumptious! And it is good to hear it tasted great too. Thank you Judy 🙂 The cakes are definitely worth the journey! It drives me crazy when you have ordered drinks and a munchie to have before your meal and everything arrives at the same time. Now we tell the waiter to bring us our wine and our appetizer and tell them we will decide later if we want anything else to eat. A little later we order our main course. Thanks Karen. And good idea! I might have been more forgiving if the pizza had been as good as I’d been expecting.